Easybun Warmer - Made of a waterproof and breathable ripstop nylon shell, with a fleece lining that extends from edge to edge. The weighted corners allow for the best stay-put rump rug in the endurance world. Four D-rings provide several options for attachment with BioThane straps to back of saddle. Comes with nylon strings for added attachment options and storage. Elastic/Velcro loops on each side also allow for easy roll-up and storage while riding. EasyIce Boot - EasyIce Boots are made of a 400 denier cloth shell with a non-toxic silicate gel filler that freezes solid for the ultimate in cold therapy. A 1/2” foam layer through out provides for insulation and longer lasting coldness. Fastens with four 2” wide Velcro and elastic straps. EasyIce Boots conform closely to the leg and are perfect for leg fatigue after longer rides or injury therapy. 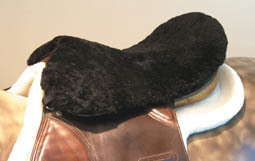 Full English Cover - A complete cover for your English style saddle. Protect your saddle as well as your seat and legs. Attaches with elastic and hook and loop strapping. Available in 3 styles: All-Purpose, Dressage, Wintec Endurance. Compare at: $49.00 English Seat Only - A “not too bulky” cover for all. 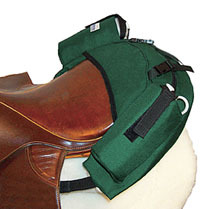 Fits most English All-Purpose and Dressage style saddles up to an 18.5” seat size. Attaches with elastic and hook and loop strapping. Deluxe Western/Endurance - The ultimate in western style covers. The extended sides make for a more comfortable ride. New hook and loop fender strap and grommeted ties guarantee a secure fit for most Western/endurance model saddles. Full Western Cover - Ride with total comfort...even in shorts! 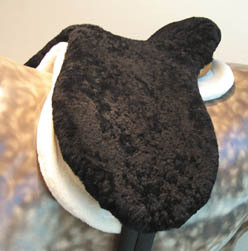 This complete saddle cover for the Western or endurance saddle covers the seat all the way down to the stirrups. Three new hook and loop fender straps and grommeted ties guarantee a secure fit without removing the stirrup for attachment. Western Seat Only - Soften the blow of those hard Western seats. Fits most Western and endurance model saddles with a pommel. Attaches with ties and elastic strapping. Deluxe Stowaway - Our roomiest pack ever! Made to fit most Western, English or endurance style saddles. The large compartments are designed to hold all of your on-the-go necessities. The main center pouch is very spacious and easy to access without items falling out. Each of the side pouches can hold extra water bottles or two #2 Easyboots. The pack attaches with a nylon strap that wraps around the saddle cinch ring or billet straps and tightens down creating a secure no-bounce fit. • 420D Ripstop with waterproof urethane backing. • 9 zippered easy-access compartments to organize and store your essentials. • Ability to carry up to four #2 Easyboots or extra water bottles. • Nylon adjustable straps with reinforced tabbed ends for tying down a coat or securing contents. • All outer seams reinforced with durable binding. English Stowaway - Made to fit any English or English/endurance model saddle. Comes with two 20 oz. water bottles. Attaches around the billets on your saddle and secures with hook and loop strapping for a tight no-bounce fit. 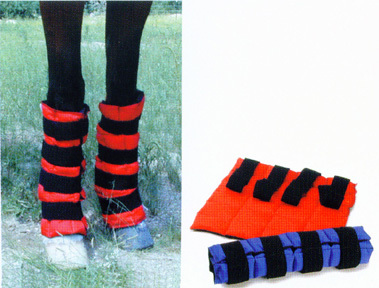 • Special cantle sleeve design helps keep the pack off the horse’s back. • 5 zippered roomy compartments to organize and store essentials. • 2 contoured and insulated water bottle holders. 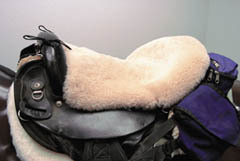 • Foam-padded bottom panel lined with durable, soft, short-pile fleece to protect the saddle and the horse’s back from the weight of the pack’s contents. • Nylon straps with reinforced tabbed ends. • Nylon adjustable straps for tying down a coat or securing contents. Stowaway Pommel - Made to fit any Western, English or endurance style saddle. This innovative combo pack will easily transform to fit a Western or English style pommel. Pack comes ready to fit a Western style pommel, but simply remove the pommel straps and it will attach easily to your English style pommel with small nylon loops that connect to the front d-rings. 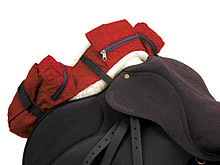 The sides of the pack attach with a nylon strap that wraps around the saddle cinch ring or billet straps and tightens down, creating a secure no-bounce fit. • 7 zippered roomy compartments to organize and store essentials. • Center pouch features a cell phone pocket, elastic loop straps, and a sunglasses or rider card compartment. • Side pouches feature a glove/keys hook, neoprene lip balm holder above pouch, capacity for two 20 oz. water bottles in each pouch, and additional zipper pouches on exterior. 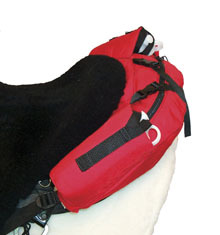 • Foam-padded bottom panel lined with durable, soft, short-pile fleece to protect the saddle and the horse from the weight of the pack’s contents. • Nylon adjustable straps with reinforced tabbed ends help anchor pack and secure contents. Western Stowaway - Made to fit any Western or Western/endurance model saddle. Comes with two 20 oz. water bottles. Attaches to the saddle cinch ring or fender straps and tightens down for a secure no-bounce fit. Complete HiTie System - The HiTie™ is manufactured by a leading hitch and receiver company. All rugged steel components are chromed for appearance and to avoid rusting. The fiberglass rod used in the HiTie™ system is also used in mooring whips designed to dock and protect boats up to 72,000 lbs. The new Adjustable Bungee eliminates the need for a runner extension and allows you to set the bungee height at your preferred level. It is simply the best horse tie on the market. Comes complete with all parts required for attachment and use. This product is made as an act of love by the maker. He really enjoys having a great tie system for your horse. At this time, we are passing any sales of this item direct for you. 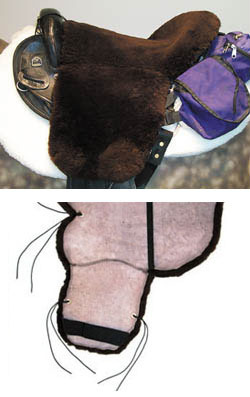 Sheepskin Accessories - Saddles aren't the only items that need a little padding. We carry noseband covers, girth covers and protectors as well as stirrup leather covers to make your ride the most comfortable for you and your horse.